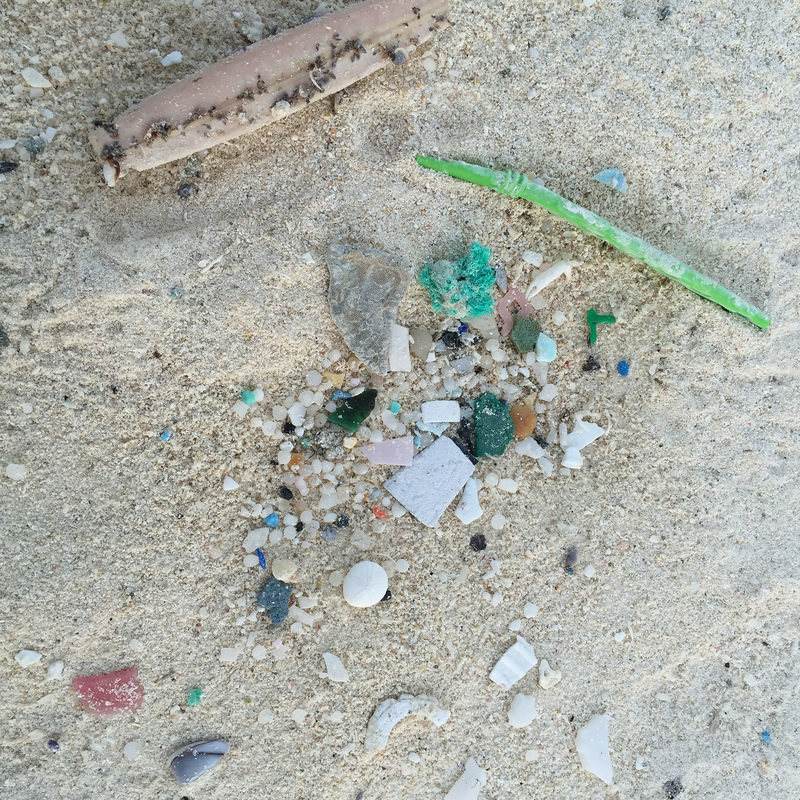 ​Plastic is ubiquitous in our lives. 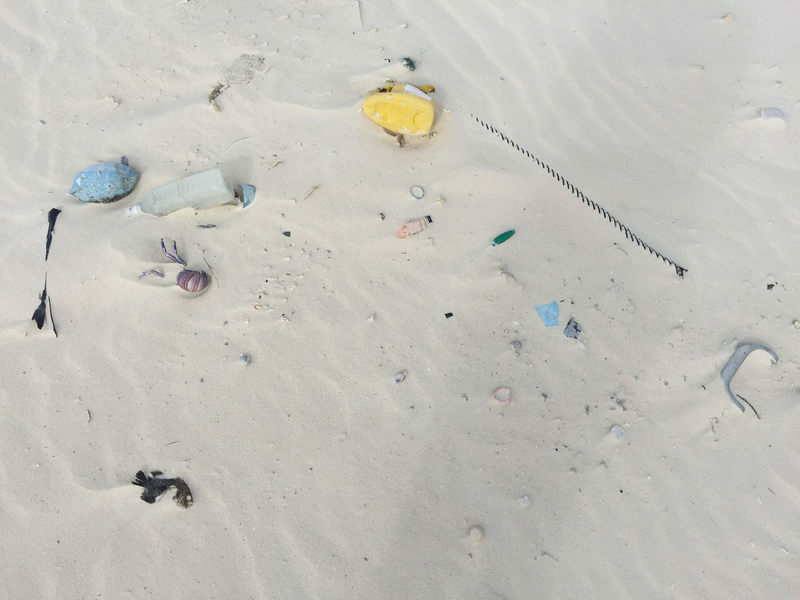 Plastic pollution increasingly pops up in news media. Plastic litter is even emerging in art galleries and nonprofit missions. 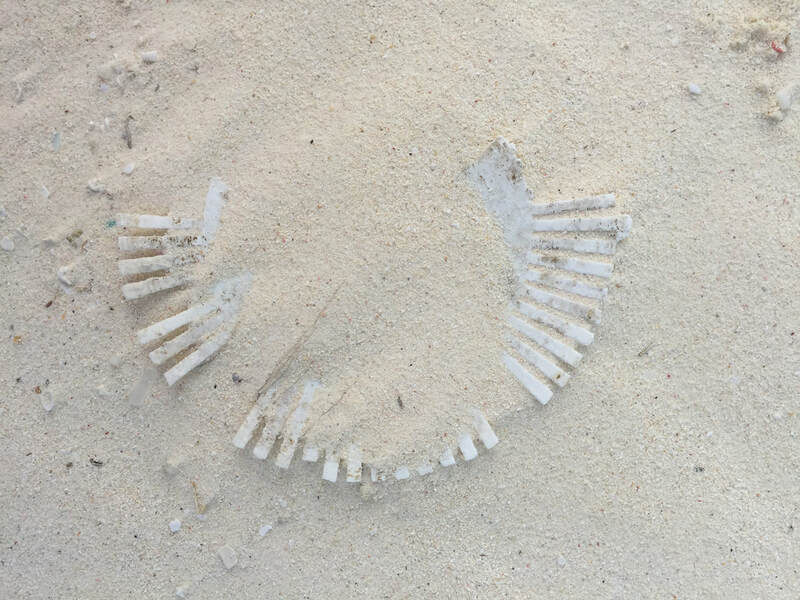 So perhaps we shouldn't be surprised that plastic finds its way to the globe's most remote areas. For example, ocean currents convey plastic trash to the middle of vast oceans. Like a network of rivers flowing through the sea, currents form gyres where trash accrues in giant "garbage patches." A small portion of that plastic is freight fallen from cargo ships. But the bulk is not product lost in transit to factory or market. Rather, it is post-consumer waste, litter that either bypassed or escaped from waste management systems. 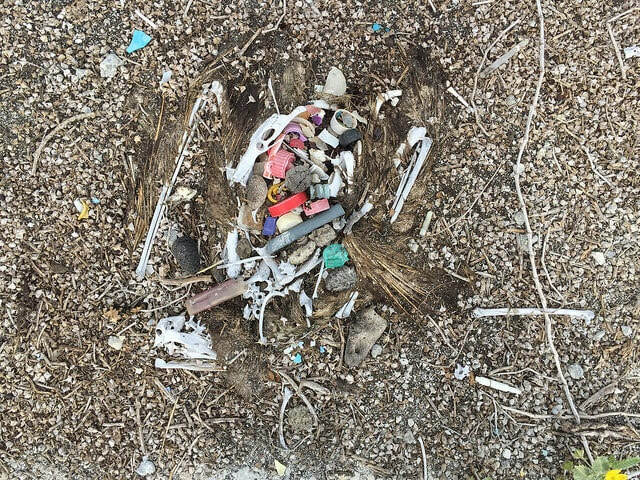 Plastic debris is conspicuous at Midway Atoll National Wildlife Refuge, a site near the western end of the Hawaiian archipelago. Midway is so-named for its location in the North Pacific Ocean, midway between North America and Asia. 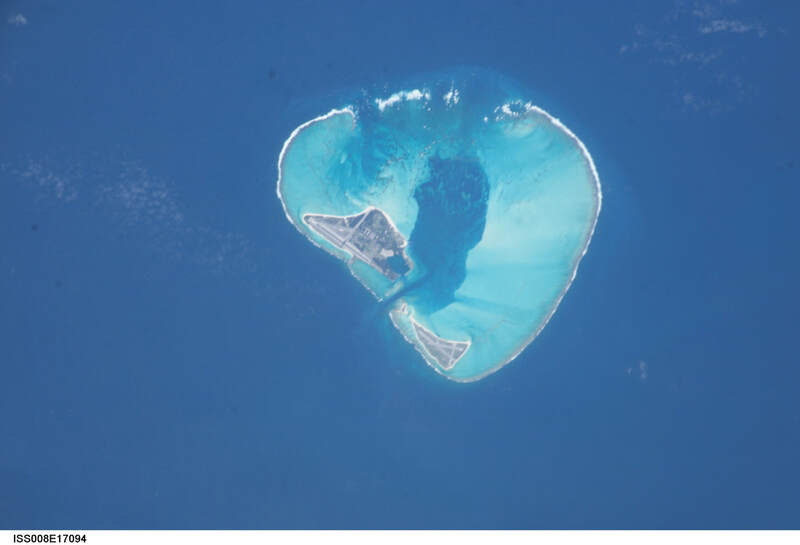 It consists of a ring-shaped reef encircling a lagoon and three small islands. One explanation for plastic on Midway is the 2011 tsunami, caused by the Great Tōhoku earthquake in Japan. That March, a sea surge completely submerged Midway's low-lying Eastern Island, leaving behind all manner of plastic debris. 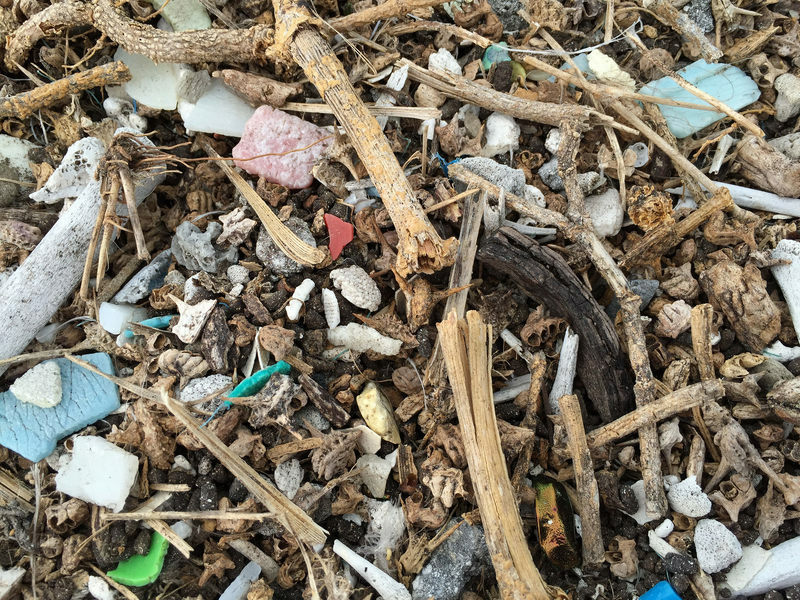 Another reason for Midway's plastic is its rocky reef, which snags material borne on ocean currents. 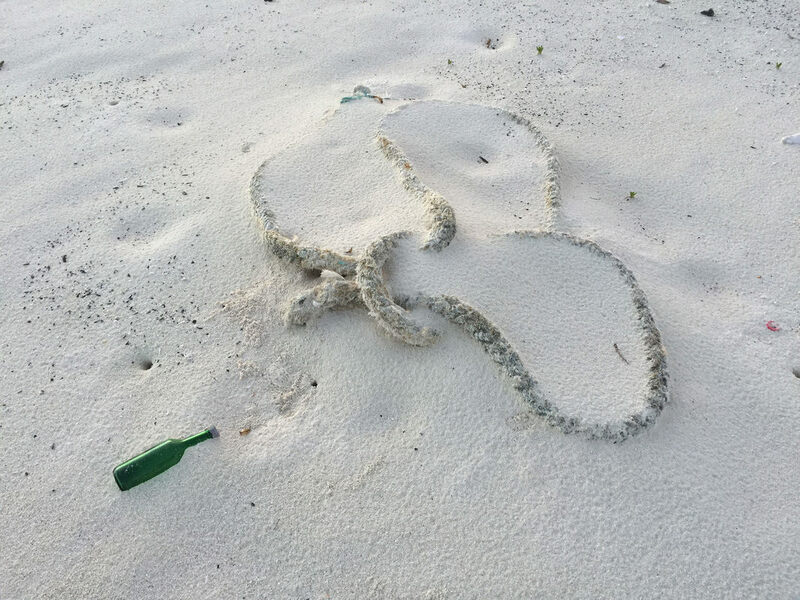 This problem is especially noticeable for abandoned fishing nets, so called "ghost nets." 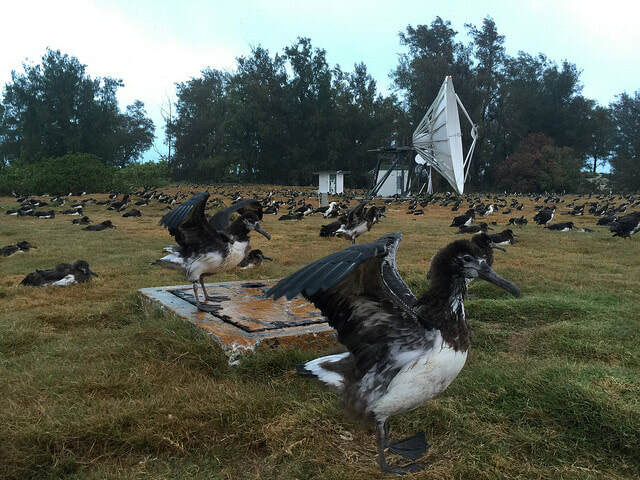 A third pathway is via albatross. To describe that process, it's helpful first to consider the life history of an albatross. An adult albatross lives most of its life at sea. It returns to land for one purpose: to reproduce and raise young. This land-dependent sliver of its existence provides a glimpse into the bird's life, which is decades long and largely unobserved by humans. Albatrosses congregate on small islands where nesting colonies are extremely high-density. 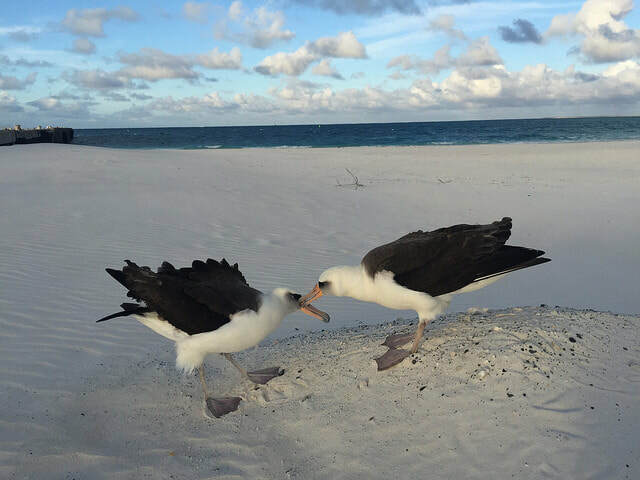 On Midway, a census of Laysan Albatross (Phoebastria immutabilis) during the early breeding season might easily report 700,000 or more birds. 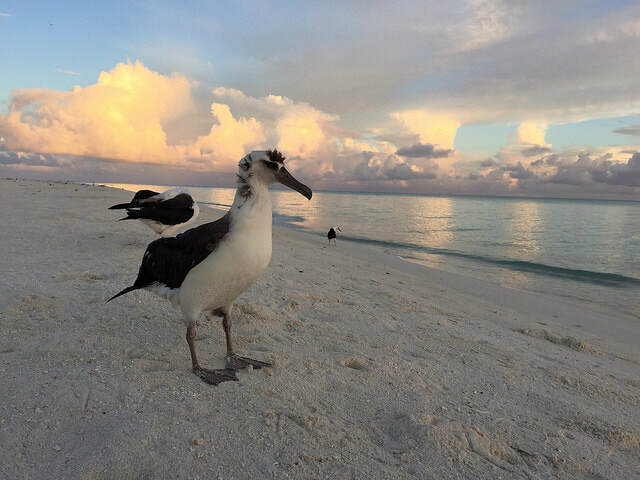 When I observed these astonishing birds in person, they made two impressions on me. First, they are remarkably social. In pairs or groups of three or four birds, adults busy themselves with complex, synchronized interactions. Their socialization entails vocalizations, bill chattering, and dance-like movements. Second, their consumption of plastic is disquieting. 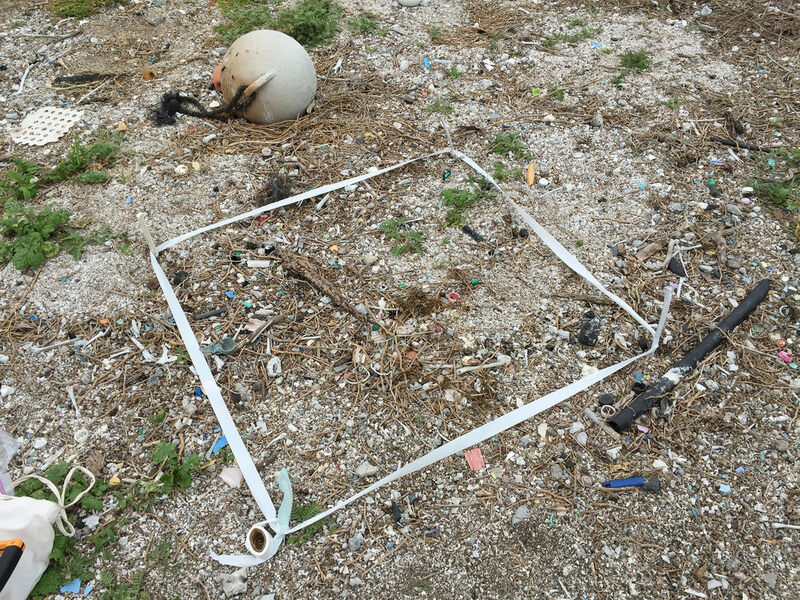 Plastic floating on open waters resembles an albatross' prey, such as squid and fish. 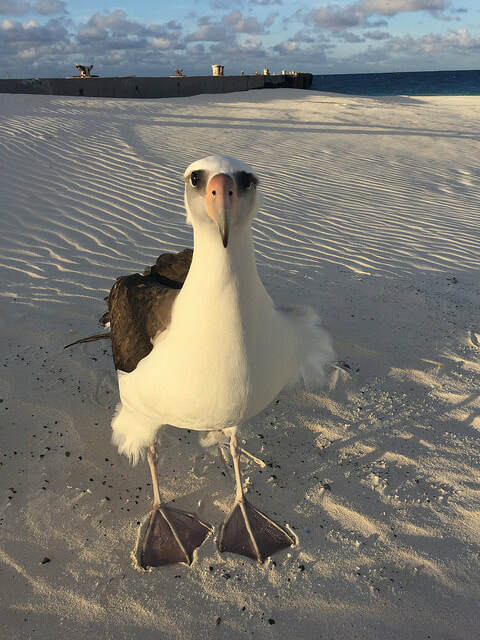 In addition to intentional capture of plastic items, albatrosses also inadvertently consume plastic when skimming their bills along the water surface to forage. Albatrosses carry plastic back to the colony in their digestive systems, and then feed it to chicks. 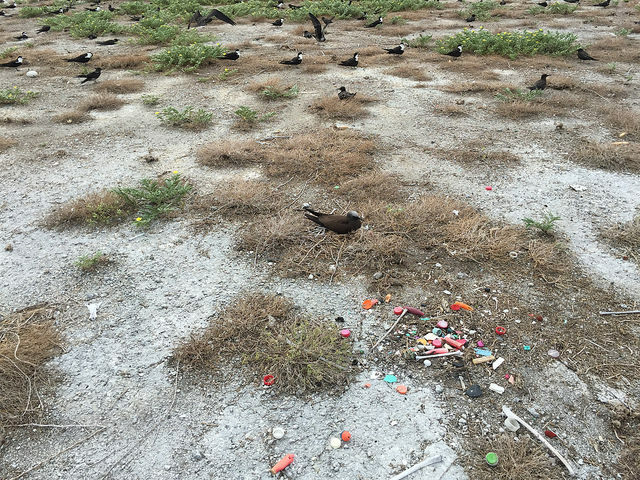 Naturally, the birds cannot digest plastic. 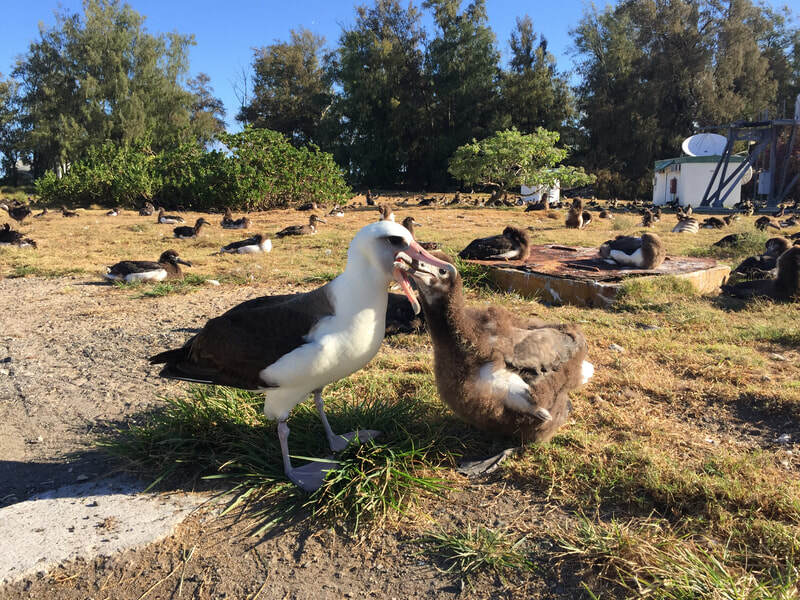 As it happens, however, consuming non-digestible marine debris is a normal part of albatross biology. Squid beaks, for example, are routinely ingested. 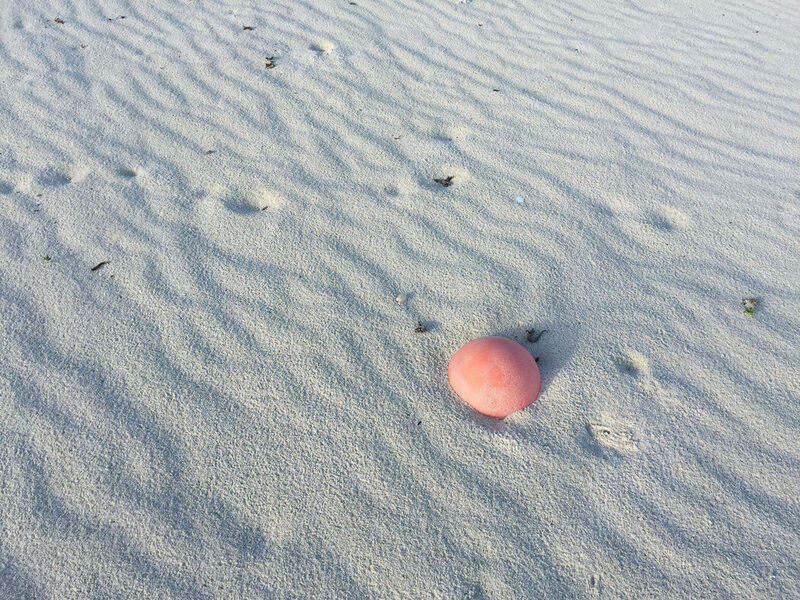 Even small pumice stones make their way into the diet. 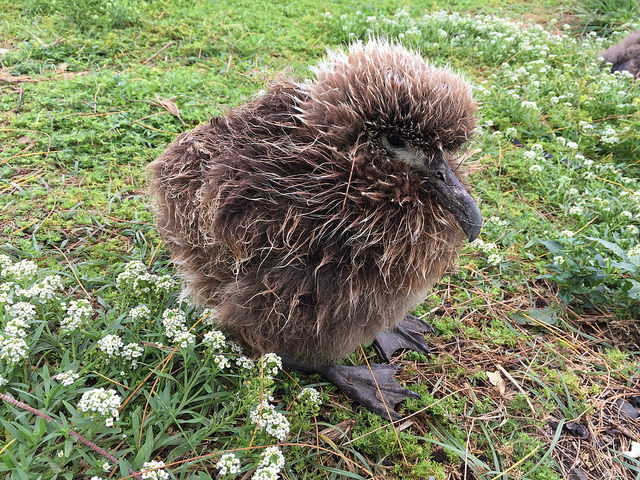 A special adaptation renders these eating habits harmless: albatrosses regurgitate non-digested materials in a bolus, or ball-shaped clump. Expelling a bolus reduces a bird's weight, and chicks typically regurgitate before first flight. The bolus has an evolutionary history and, at least superficially, a novel usefulness. However, little is known about broader effects of plastic consumption. 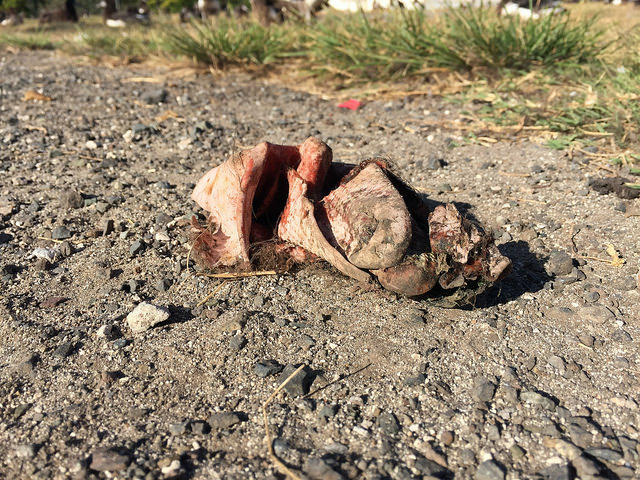 Based on what we are learning about plastic's impacts on wildlife and ecosystems, one does pause to wonder. 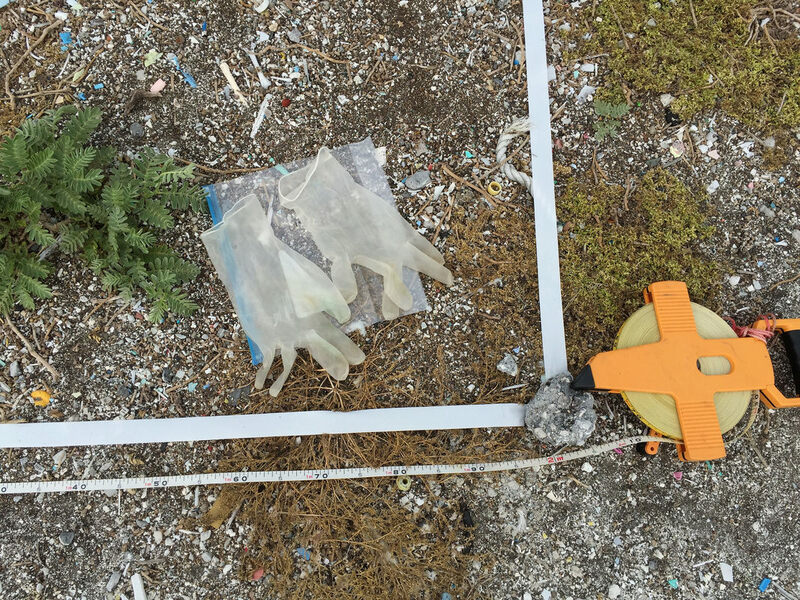 Potentially, plastic could affect any level of biological organization, from organ system health (e.g., digestive or endocrine), to individual survivorship, to population trends. Research into these matters is scant. In the meanwhile, plastic persists (and accumulates) in the environment. 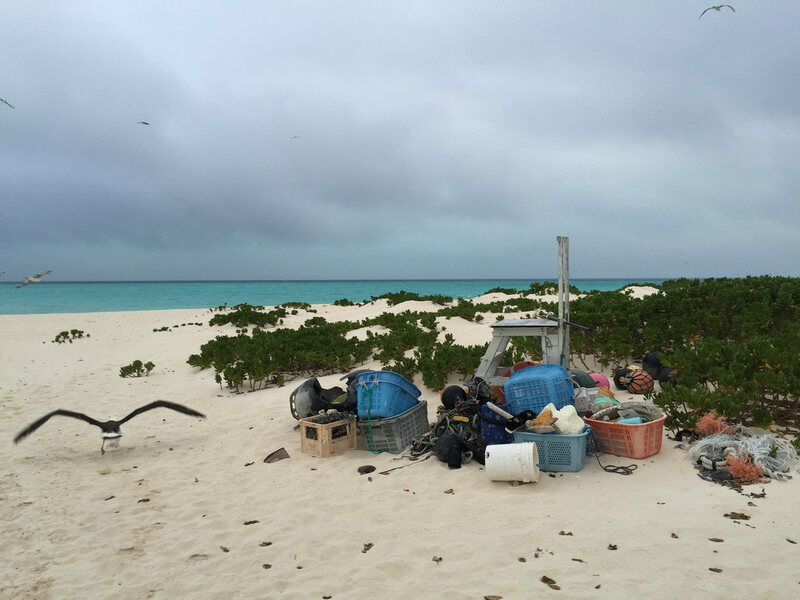 ​Many small plastic items on Midway's islands arrived via the body of an albatross. This fact is readily apparent in boluses and carcasses, both abundant across the colony. Most efforts to collect and remove debris focus on large items such as tires and nets. Over time, plastic becomes brittle and breaks into smaller and smaller fragments. Plastics do not decompose, but they do degrade. That process is accelerated by exposure to seawater and sunlight. These factors also deform plastic, re-shaping familiar objects into unrecognizable blobs. Those tiny shards and globs captured my imagination as an artist. I wanted to explore the density and ubiquity of these small plastic pieces. 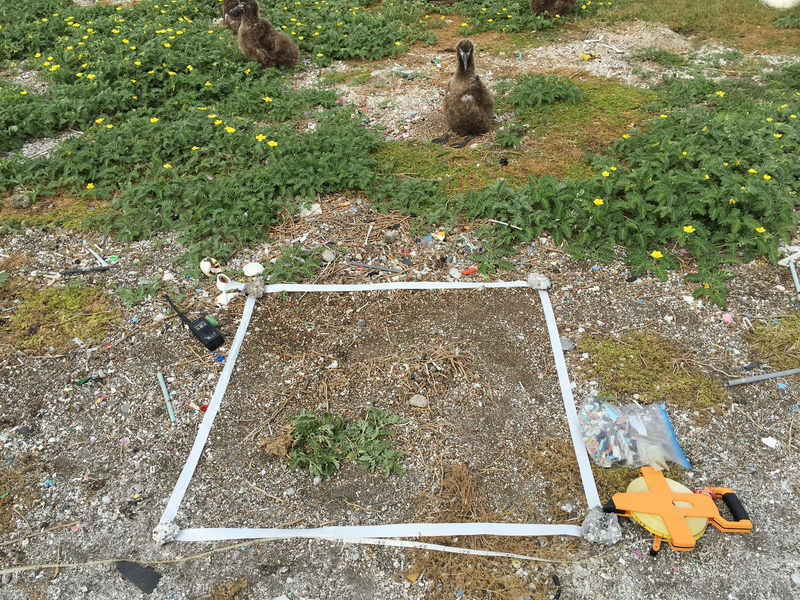 To do so, I measured out small plots (1 x 1 meter) and attempted to remove anything I identified as plastic. Quickly, I realized that even within a small area, complete removal was virtually impossible. The plastic is so pervasive that it makes more sense to measure effort in terms of time, rather than area. 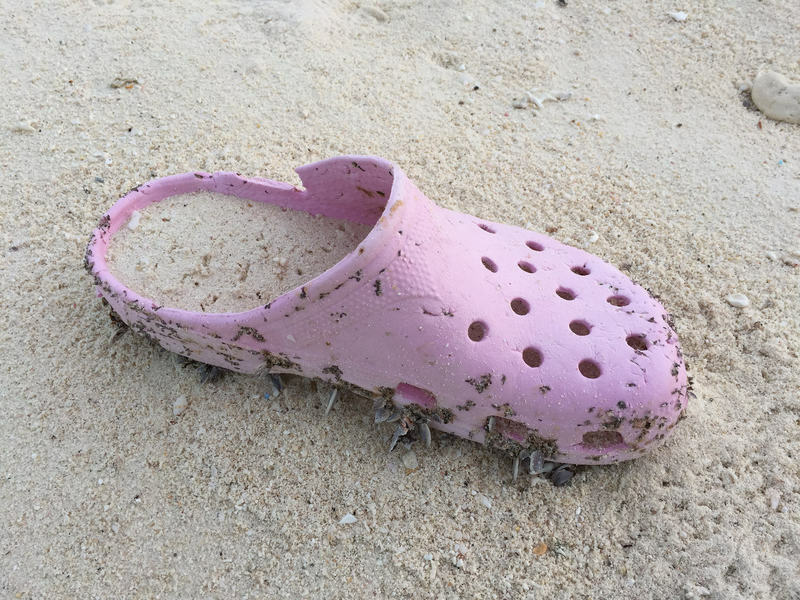 In addition to considering the prevalence of plastic, I'm curious about its physical forms. I'm particularly intrigued by ordinary commodities--like bottle tops and toothbrushes--that mutate into bizarre sculptures. To examine that transformation, I'm creating a series of drawings and paintings. The work also reflects on greater themes of loss and persistence, familiarity and strangeness, and wholeness and broken-ness.
. . . more images to come . . .